No wonder Amazon is looking to form a "second" headquarters in a different city. Seattle socialist City Councilmember Kshama Sawant led a protest on Tuesday outside Amazon. 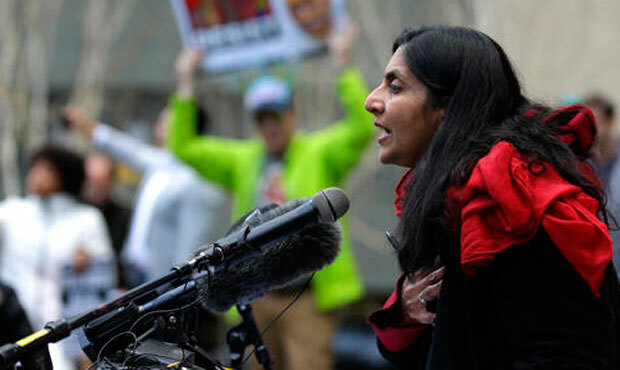 The protest, Sawant said, was to fight for taxing big businesses such as Amazon to fund affordable housing. Sawant is a proponent of an employee hours tax — or head tax. If she really wants to add some sizzle she should invite Jimmy McMillan to come to town. That "Rent Is Too Damn High" shtick of his is sure to please. Importing non libertarians from the 3rd world has consequences. If the US gov had admitted only libertarians, then the county would be a ghost town. Right, PH. You sit there and try to pretend that no one from a 3rd world country could ever come to America and provide value, because one in every million or so turns into a socialist nitwit politician. Socialism is not found only among Third World folks. There are plenty of socialists among Americans with traditional, western European backgrounds. They're the ones who have gotten the US into the mess that it is in today. The problem isn't the toxic, new ideas/principles that are imported, but rather, our own people's lack of confidence in our own old ideas/principles. Advocating "no newcomers with different ideas" is sheer laziness, and illustrates a lack of confidence or willingness in our own ability to persuade others of the morality and effectiveness of Founding Principles. A more worthwhile and moral objective would be to attack the "bad ideas/principles" our young generations are repeatedly exposed to and influenced by, in public schools and universities, i.e. abolish all indoctrination by our own government (public schooling), have a separation of education and state, and break the cycle of churning-out socialists from within our own country. Seriously, what's more dangerous---the millions of socialists graduating from government high schools and colleges each year, vs. the tens of thousands of immigrants coming here? Yes, those damned papist Irish!